90% cotton, 10% lace,hollow designed breathable,comfortable and lightweight. 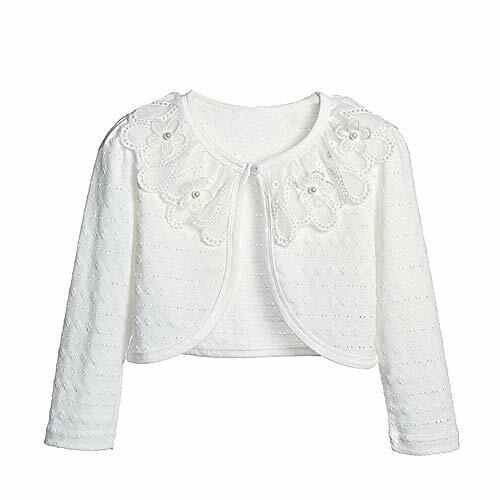 Girls kids dress shrug bolero cardigans for flower girls/bridesmaid of 1-8 years. Lace neck with artificial pearl decotated makes it look elegant on your girl. Fits your girls princess dress,sleeveless outfits,tank tops,also can be an outwear jacket to protect cool air and sunlight. Suitable for bridesmaid, flower girls, wedding, party, birthday gift, pageant, school dance, performance show,evening or other special events ,daily wear etc.